The latest introduction to the line of quality intakes from is the Satin Bobber intake. This billet aluminum CNC machined intake features the brand new IBS “internal breathing system” with patented top breathers and is manufactured right here in the United States. There’s also a new curved radius on velocity stacks and an improved mounting system. The finish is a combination of brushed aluminum with durable black satin powder coat. This Satin Bobber unit has an internal tapered filter screen for protection and performance. 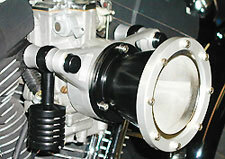 Manufactured to fit almost every American made V-Twin and some metric applications as well. This new intake fits all popular carburetors and motors including all fuel injection systems, even the new ‘08 drive by wire. A rain sock is also available for inclement weather. I love the way this air filter looks, but I’am a little skeptical about putting it on a 30K dollar bike that I ride a lot. Can some one know who knows what their talking about let me know if it is worth it. That last thing I need is a bad motor. I love the way this air filter looks, but I’am a little skeptical about putting it on a 30K dollar bike that I ride a lot. Can some one who knows what their talking about let me know if it is worth it. That last thing I need is a bad motor.